I’ve decided to do an update of all that is going on at Bottleheads HQ at the moment, as I have been in the card-making zone this week. Most of the cards are just ideas I am working through at the moment rather than anything I’ll commit to putting up on Etsy just yet. I have started trying out adding words to cards now, so they can carry a message at least. I was never quite sure how to do it previously… now I have a very basic method which involves printing off some Microsoft Word fonts and tracing them! It’s highly inaccurate, limited according to the size and style I have to hand (I’ve no printer of my own, or Word programme for that matter), and quite possibly in breach of Copyright laws knowing my luck… But it’s fine for cards for family and friends at least! 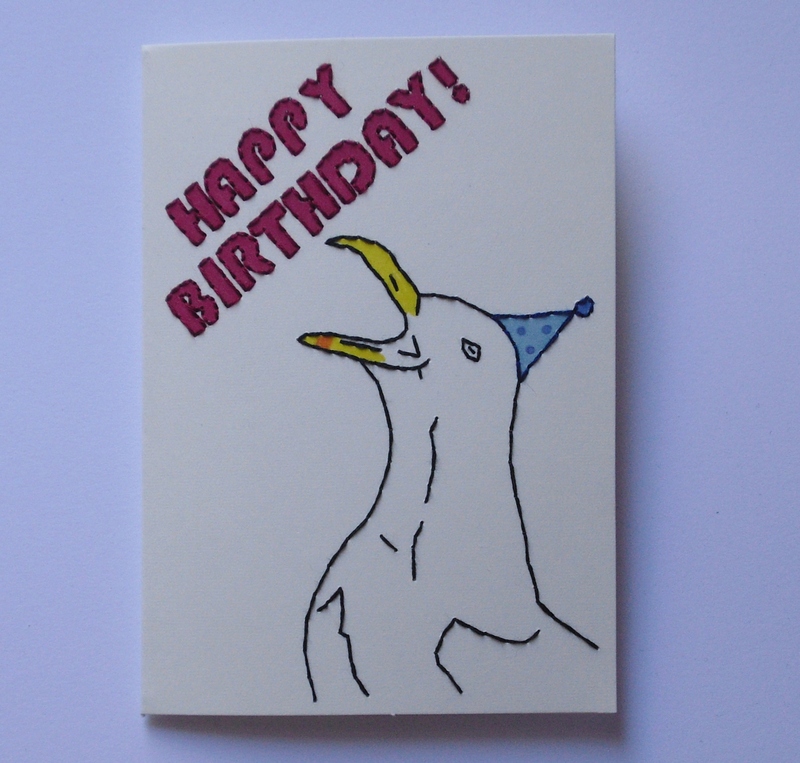 On this card, I wanted it to look like the seagull was yelling Happy Birthday, just because I think gulls look quite funny when they shout, especially when they wear party hats. That could just be me though. I also think it has a vaguely retro poster look about it, which pleases me. I’m staying with the sentiment theme on this one. 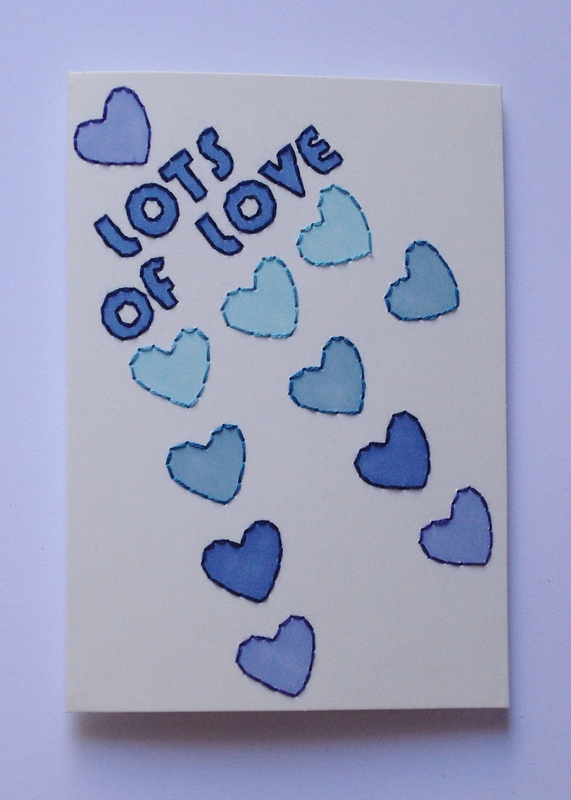 I quite like doing the message at an angle, so thought it would be nice to do the hearts at an angle too. The card doesn’t quite work for me, maybe because it isn’t symmetrical or something. I can pretend all I want, but I really don’t know that much about design layout principles, mainly just working off instinct. That aside, I do like the idea for this card, and intend to play around with it until I have the design more satisfactory. 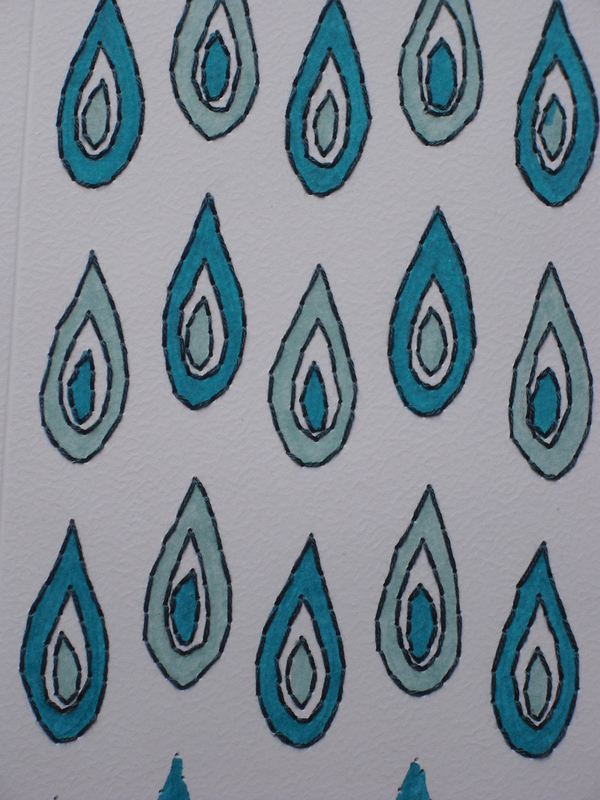 I like the colours too, I have a nice range of blue pens which came in handy for this card! I bought a new size of card recently because working in smaller sizes limits how much detail I can add, especially with pricking holes for the thread which weakens the integrity of the card. It’s one reason why I favour working with 300gsm quality card, even though it is more expensive than thinner card. The new cards are 5 x 7″. They are only 240gsm, as I am viewing them as ‘prototypes’ or ‘demos’ (depending on my mood) until I am sure I want to buy the more expensive pack of 50 thicker cards! 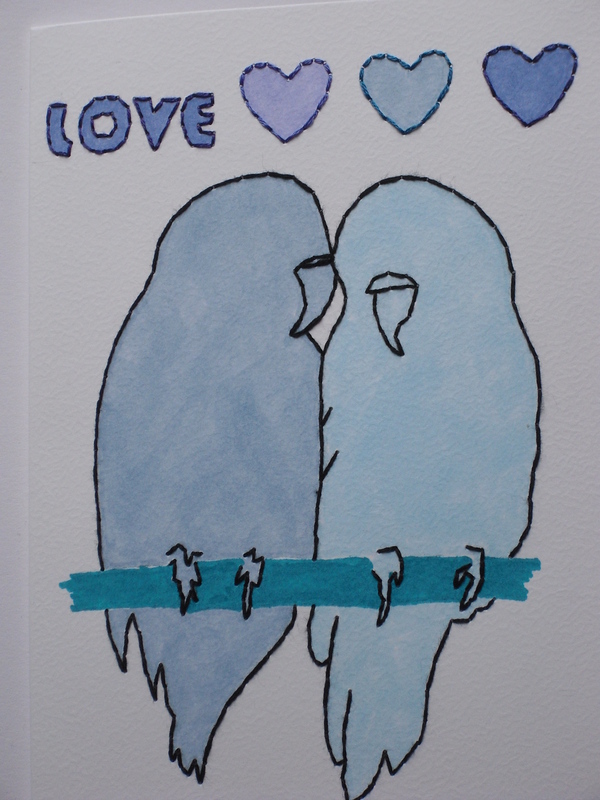 The card above is in the new 5 x 7″ size, using a little sketch I had done of two lovebirds (looking quite like a pair of budgies!) that I later turned into a simplified line drawing. 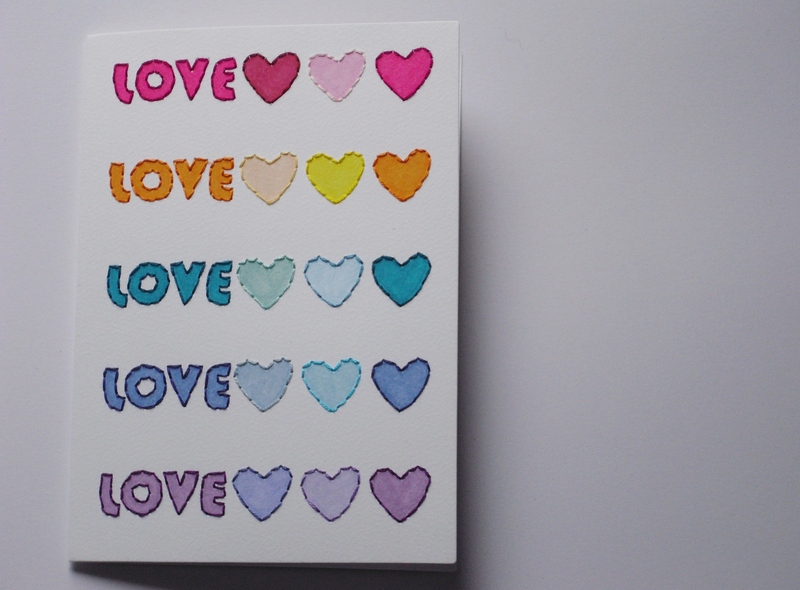 I quite like it, I think it’d make a nice Valentines or anniversary card, although I didn’t write the “Love” on very straight! I always really enjoy doing this design on a card, probably because it is quite simple, clean looking, and relatively quick to make. The design hasn’t been all that popular on Etsy in terms of views or favourites out of all the cards I have on there, but I’d still be quite happy to put this one up. I chose the colours as I wanted something bright and slightly clashing… and also because I had seen the two colours together on a necklace at a craft market earlier in the week and just really liked them! For some reason, I thought it would look nice to use the leaf/petal part of the design from the previous card, and repeat it. I thought it might form a nice background for a card… However, sometimes I just fail to see the point in what I am doing, much like in the case of this card above. There is a good reason why printing was invented, and later computer software to design nice accurate repeat patterns in clear colours. Doing it by hand is not a particularly good idea, as it takes FORVEVER, and looks wonky too. 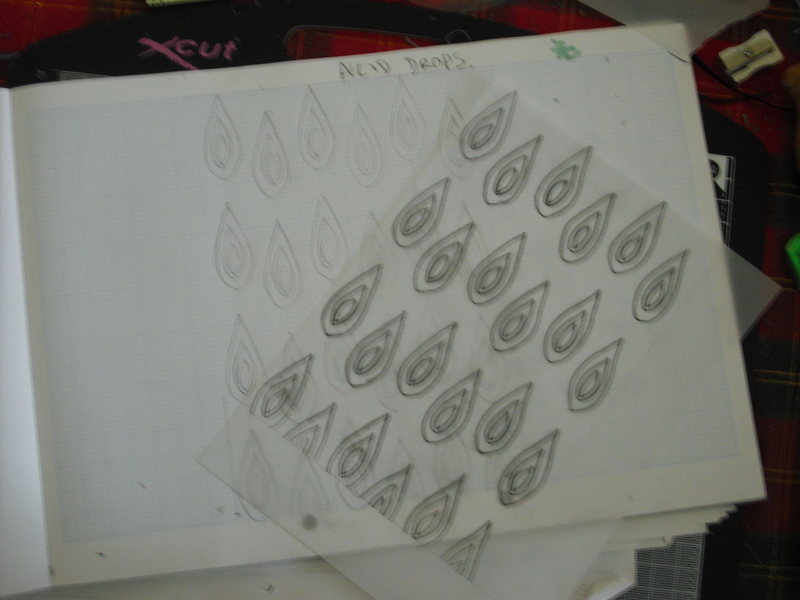 I did use tracing paper to try and save some time, but it still took ages… I guess that is OK on a rainy afternoon when there is nothing else to do. Tags: Birds, Bottleheads, card-making, Crafts, doodles, Love, sewing. Bookmark the permalink. I like these! I love making cards, and I’ve just gotten into embroidery, but I don’t think I could do it without making the paper all wrinkly and full of holes. Props to you! The seagull is especially cute. Thanks! 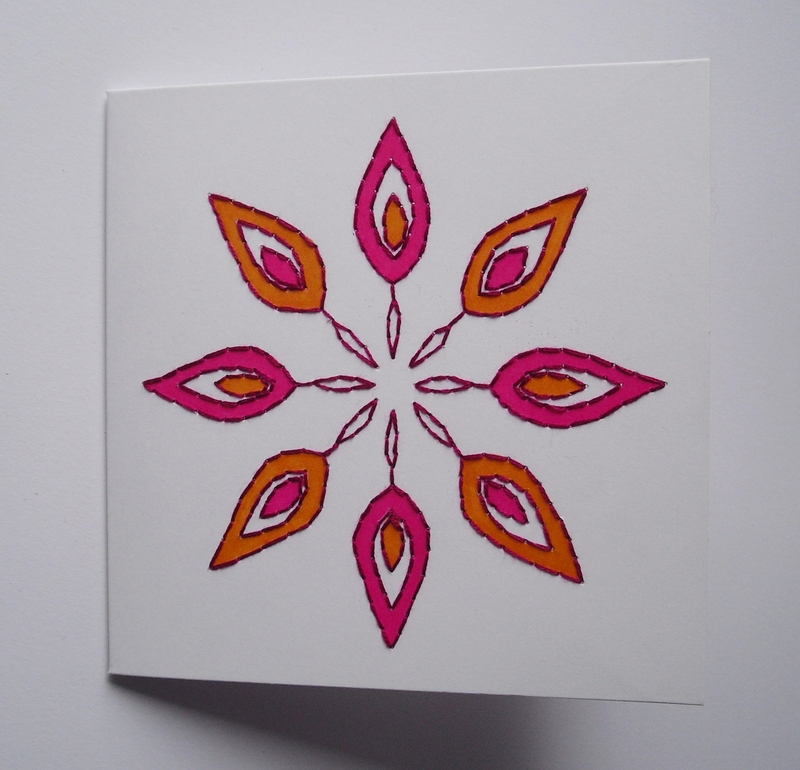 The secret with embroidering the cards is to prick the holes onto the card before you start sewing. If you use thick enough card, it shouldn’t go wrinkly! I really like the blue drops/petals! Thanks! I quite like them too, I’m just not sure how I’m going to use them yet… also, they are extra slow to do, and tricky to get neat and accurate, although I like to think their imperfections add a bit of charm!